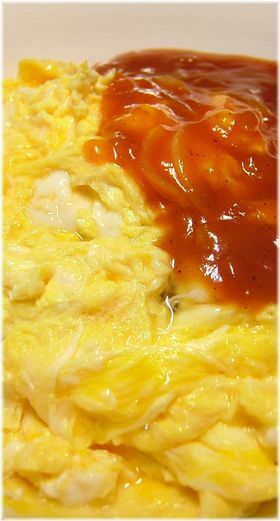 As I explained to Rowena in my last posting, “Omu Raisu” or Japanese-style Omelette is a very popular dish, hot or cold among Japanese, young or old. When I said that the Missus was not too keen on having her own creation pictured on this blog was because it looks so much better hot just served on your plate. The basic way is to fry leftover rice with bits and pieces and seasoning, and preferably tomato sauce. But this is entirely open to personal preferences. When served hot, the omelette is prepared very much French style, elongated, thick and with a soft core. The trick is to place it on top of the rice, make a shallow cut along the middle and let the omelette open and spread/fall over the rice! do you mean after the eggs are cooked?